(April 19, 2016) – USA Cycling and Chobani have partnered ahead of the Rio 2016 Olympic Games for a multi-year deal that will offer athletes and members alike nutritious snack options and recovery solutions with America’s No. 1 Greek Yogurt brand. USA Cycling and have teamed up ahead of the Rio 2016 Olympic Games. 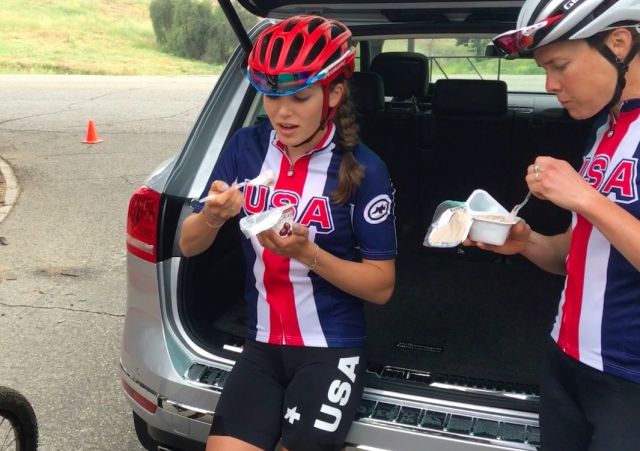 A high source of protein, Chobani will support USA Cycling athletes at home and abroad as a method of recovery. Functioning as a part of a meal, snack or an ingredient in cooking, Chobani Greek Yogurt is recommended by U.S. Olympic Committee dietitians, and is also used in recipes by Team USA chefs. Chobani has a history of sponsoring athletes directly as part of its commitment to supporting athletes who share the brand’s mission to eliminate “bad stuff” from their lives in exchange for goodness and positive choices. Through its founding food philosophy of using only natural, non-GMO ingredients and never using artificial preservatives, sweeteners or flavors, Chobani has always believed you can only be great if you’re full of goodness. For product information or to get to know more about Team Chobani, visit chobani.com, or join the conversation using #NOBADSTUFF. Recognized by the United States Olympic Committee and the Union Cycliste Internationale, USA Cycling is the official governing body for all disciplines of competitive cycling in the United States, including BMX, cyclo-cross, mountain bike, road and track. As a membership-based organization, USA Cycling comprises 64,000 members; 3,000+ clubs and teams; and 34 local associations. The national governing body sanctions over 2,600 competitive and non-competitive events throughout the U.S. each year and is responsible for the identification, development, and support of American cyclists. To learn more about USA Cycling, visit usacycling.org. Maker of America's No. 1–selling Greek Yogurt brand, Chobani, LLC, was founded on the belief that people have great taste — they just need great options. Chobani produces high-quality authentic strained Greek Yogurt products made with only natural ingredients from its plants in New Berlin, N.Y., Twin Falls, Idaho, and South Victoria, Australia. Chobani is committed to using milk from regional farms and strengthening its surrounding local economies. Chobani gives 10 percent of its annual profits to charities worldwide through the company's charitable foundation. All Chobani products — including Chobani® Greek Yogurt, Chobani “Flip”™, Chobani Tots® and Chobani Kids® and Chobani Simply 100® — are kosher certified, contain five live and active cultures, and are made with milk from cows not treated with rBST*, with most of its products offering more protein than regular yogurt** Chobani products are available nationwide in the U.S. and Australia, and in countries in Asia and Latin America. For more information, please visit www.chobani.com and www.facebook.com/chobani. ** Chobani® Greek Yogurt, 12g (24%DV) protein per 5.3 oz; regular (nonfat or lowfat) yogurt 6g (12% DV) protein per 5.3oz.